Every single hour, of every single day, 40 people around the world die from drowning. This preventable killer is among the top 10 leading causes of death in every region of the world, and sadly it is children under five who are at the greatest risk of what is, essentially, a global pandemic. The World Health Organisation (WHO) last month published its Global Report on Drowning, which now recognises the serious extent of the problem. It’s a long-awaited and welcome report that sets out just how serious the issue is, and lists suggestions as to what can be done so that the global community can start to tackle the problem. Such is the enormity of the issue that it’s astounding that this is the first report and strategy of its kind to be published. We hear about other terrible blights in the press every day, but drowning is the silent pandemic. An estimated 372,000 people die every year but the true figure is likely to be much higher, possibly as high as 50 per cent more in some countries, due to the methods of data collection used. Regardless, the estimated death toll still puts drowning at two-thirds of that of malnutrition, and more than 50 per cent of that of malaria. Despite this, we have targeted prevention methods for these two issues, but none for drowning. And let’s not kid ourselves that this is solely a Third World issue, as despite more than 90 per cent of these deaths occurring in low and middle-income countries, the problem also exists in developed nations where walking next to or being near water leads to a high number of incidents of drowning. 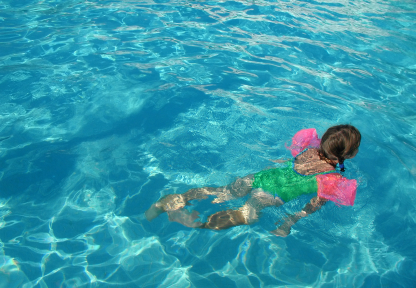 The majority of drowning happens in inland water, in everyday situations. Within poorer nations, travel and fetching water are the major factors where drowning occurs. Address priority research questions with studies. On top of these key actions, the report also outlines four recommendations that nations can implement to begin to address the pandemic, recommendations which RoSPA supports. 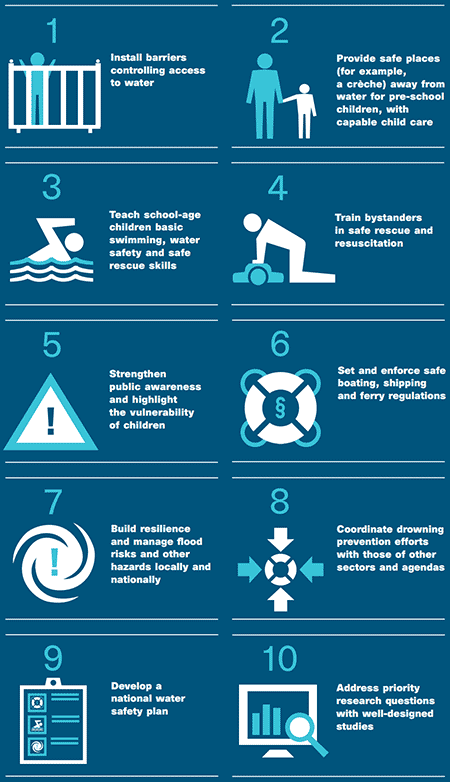 Nation states should A) implement proven prevention strategies tailored to their own circumstances, B) take steps to improve the data available, C) aim to develop a national water safety plan, and D) band together to form a global partnership for drowning prevention. Together, we can tackle an issue that is so easily preventable that it should not even be a problem. Hundreds of thousands of people are dying needlessly each year, and, as the report states, the time to act is now. Your holiday checklist – don’t forget to pack the carbon monoxide alarm. Swimming costume – check. Sun lotion – check. Inflatable lilo – check. Your holiday packing is almost complete but you’ve got that nagging feeling that there is something missing from your suitcase. Well, if you are heading off to a holiday apartment, cottage, caravan or even boat, you have most likely forgotten to pack one small item that could make all the difference to your long-awaited vacation – a carbon monoxide (CO) detector. At The Royal Society for the Prevention of Accidents (RoSPA), we recommend that people take a small, portable CO detector with them whether they are going home or abroad to prevent tragedies that we have sadly seen many times before. Carbon monoxide is known as the silent killer because you can’t see it, hear it, smell it or taste it, meaning its deadly fumes can act without families even realising it, often through the night while they are asleep. The problem is that fumes can be caused by a faulty or badly-serviced gas and other fossil fuel-burning appliance, whether it’s a heater, gas stove, generator or even barbecue in an enclosed space. Seven-year-old Christianna Shepherd and her six-year-old brother Robert, from Wakefield in West Yorkshire, died from carbon monoxide poisoning during a holiday in Corfu after a faulty boiler leaked gas into the hotel bungalow where they were staying in October 2006. Last year, an Easter boating holiday turned into tragedy when 36-year-old mum Kelly Webster and her 10-year-old daughter Laura Thornton died after inhaling CO fumes as they slept on a moored motor cruiser on Lake Windermere in the Lake District. Investigators found that fumes from a generator, whose improvised exhaust and silencer system had become detached, had spread into the cabin. Be aware of the symptoms and dangers of carbon monoxide poisoning. Just knowing a few of the signs to look out for will already have equipped you with some useful knowledge. This RoSPA video, below, highlights why being aware of carbon monoxide is so important. I’m sure you will have a lovely break and I’ll leave you to get on with that packing. Oh, and remember, when summer is over, it will be time to arrange for that all important Autumn service to your boiler at home. Alison Brinkworth, RoSPA public health support officer. I was a child in the 1970s, when, as the cliché goes, we had to make our own entertainment. Growing up in a small Yorkshire town, I played outside, walked to school and was off on my bike for hours. Mobile phones hadn’t been invented, so my parents couldn’t call to summon me home. 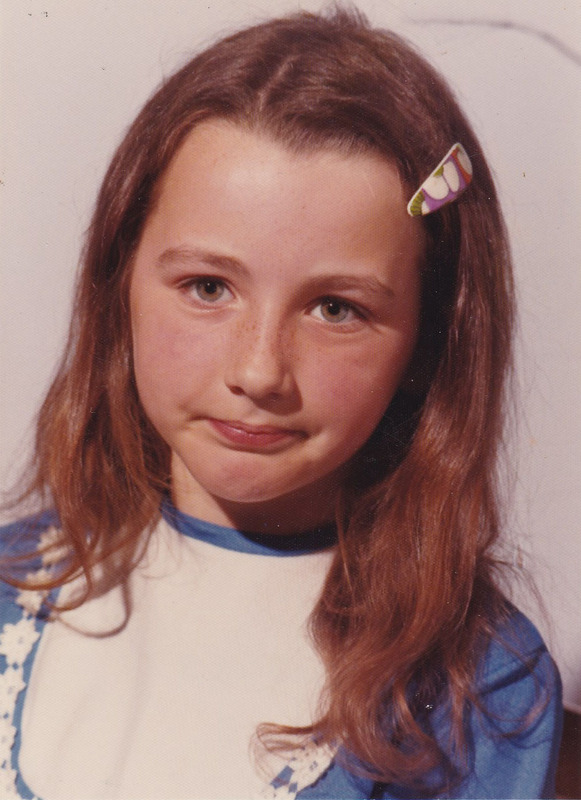 Being out and about from an early age, I learnt about risks and keeping safe largely through experience, though I was in the Tufty Club and did my RoSPA cycling proficiency test. 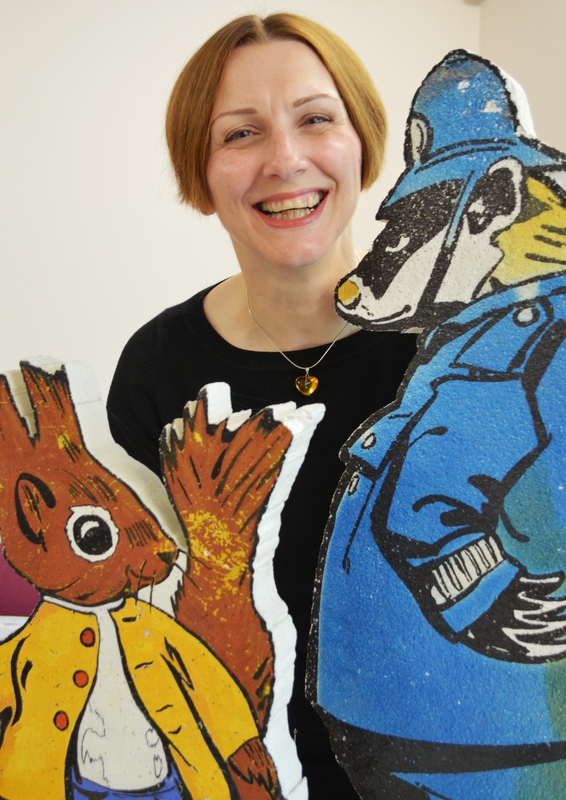 Helen now as RoSPA’s campaigns officer. Today, many children are ferried to and from school/activities and spend free time online or on a games console, so they don’t get the opportunities to experience risk that we old goats had. Plus, the rise of the internet has led to new dangers online. Which is why LASER (Learning About Safety by Experiencing Risk) centres are a great idea, giving children the opportunity to experience risk and learn how to stay safe in an interesting, interactive way. As RoSPA hosts the LASER Alliance, I was lucky enough to get a tour of Safeside, Birmingham’s LASER centre. 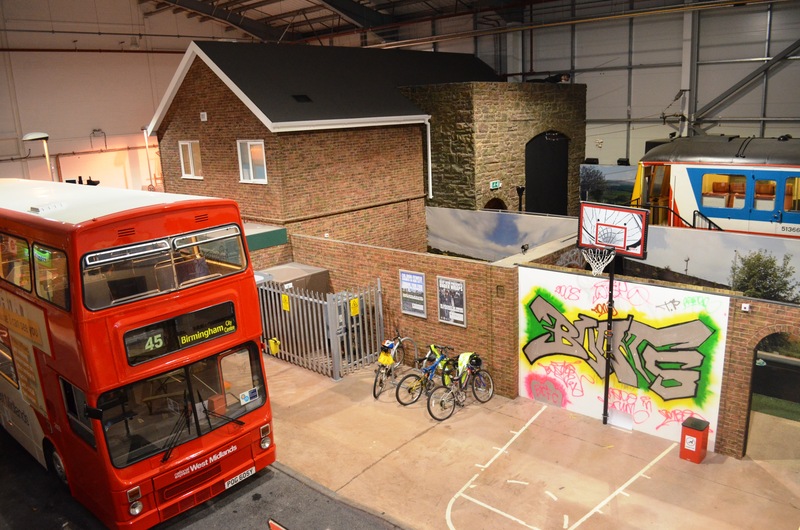 Run by West Midlands Fire Service, it boasts a full-size indoor street scene featuring a road crossing, bus, train, canal, car, home, pub, dark alleyway, police station – and more. 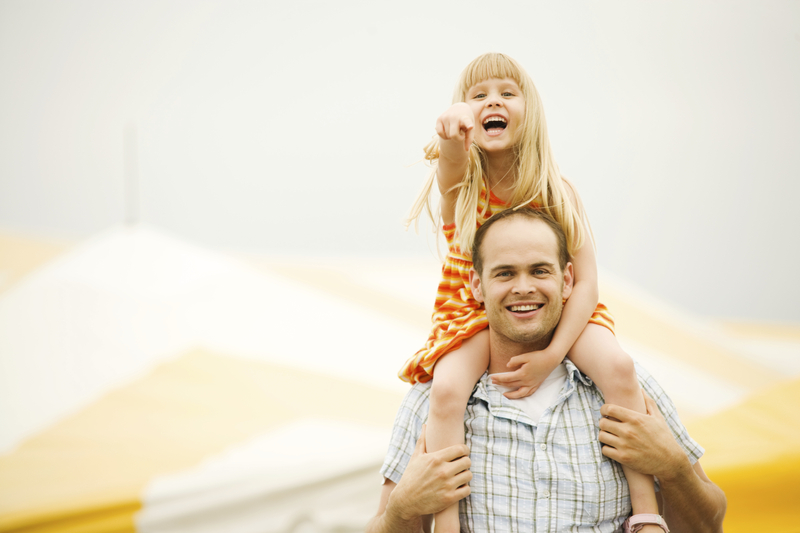 Children learn about many aspects of safety via scenarios, activities, videos and discussion. They work with presenters, guides and even students from the Birmingham School of Acting. It’s a practical, at times shocking, but fun way for children to get to grips with real life issues and consider what they should do in those situations. And it works: presenter Dave Bailey tells us of children he first met at primary school who come back to the centre in their teens. They often tell him about situations where they’ve used what they learned at Safeside – it really has saved lives. If you’re a parent group, nursery, SureStart or school, I’d really recommend organising a visit to Safeside. To find out more about Safeside and its activities , click here. Helen Halls, RoSPA campaigns officer. I love mountain climbing. Ever since I can remember my father has always dragged me along his long hikes around the local mountains of South Wales where I was brought up. I grew to love walking and I have always especially loved the beautiful sights from the summit of Mount Snowdon. 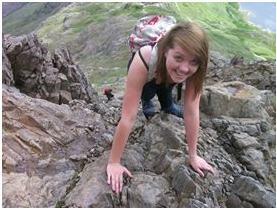 Sioned’s first successful Climb up Mount Snowdon. Prior to my accident, I had attempted to climb Snowdon twice. The first time the weather was dreadful, but it was my 18th birthday and I was determined to reach the top. We didn’t make it and we were defeated by the weather. However, my second attempt was successful – my father and I scrambled across ‘y grib goch’ and we reached the summit! I wasn’t prepared for climbing up Snowdon. Not in the clothes I was wearing nor the equipment I had with me. Neither was I prepared to suffer the exhausting after effects of climbing so high so spontaneously. I fell asleep on the ledge I was laid on. Suddenly, I woke to find myself falling. Next thing I remember is being freezing cold and not being able to see a thing for the fog surrounding the mountain. Sixteen hours later I mustered enough strength through my shivering to scream for help but got no reply. I gather I must have fallen asleep or been out of consciousness for the next few minutes or so, enough for the fog to clear, and I was just about able to see the path, the ‘pyg’ trail. I saw some people walking and managed to shout a few times for help. This time I got a reply and one of them started running towards me. “Help, I’m stuck,” I screamed. They said they would call for help, and they did. A photo of Sioned’s rescue. Twenty hours after I first fell, The Llanberis Mountain Rescue Team had managed to climb down to find me. I don’t remember much detail but my gosh was I glad to see them. 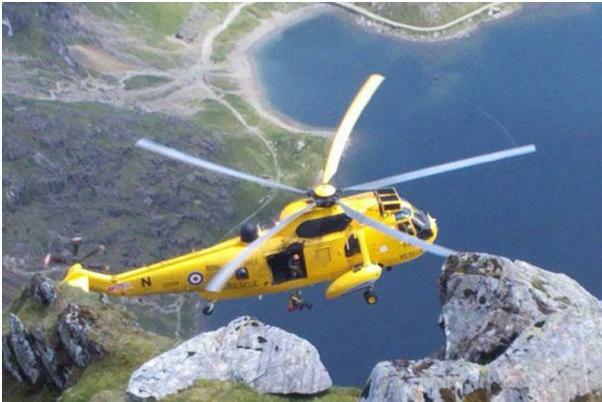 The RAF Mountain Valley Rescue team then turned up, and apparently it was piloted by Prince William. Finding me was half the battle as they didn’t know where I was. I was found 300ft short of the summit. I was taken to hospital where I found out I’d suffered multiple spinal fractures as well as a fractured sternum and gouges to rival the Grand Canyon. I lay flat on my back for almost two weeks. I then learned to walk again following an operation to insert two titanium rods into my spine. I have learned never to go ill-prepared and always to let someone know where I am going, and what my plans are! The main factor contributing to my accident was my little preparation and the fact that I hadn’t told anyone even though I felt prepared. I didn’t realise the danger I was putting myself in to. Sioned walks for the first time since her accident. My recovery has been long and difficult. At the time of my accident, I was in my first year of a nursing degree. Now my hopeful career of nursing has had to be put on hold while I recover. I miss my old student life and would like to raise awareness of the dangers of climbing mountains unprepared. Sioned has been very brave in sharing her story. Rescue operations of people who have misjudged the dangers while climbing mountains or who were unprepared for the conditions are common and there are lots of sources of advice for climbers, hill walkers, and mountaineers, available from the British Mountaineering Council. RoSPA’s advice is to be prepared for the terrain and always have a plan B. Through the centuries, Glasgow has been a hotbed of both enlightenment thinking and industrial activity. So where better to stage RoSPA’s 57th Occupational Health and Safety Awards? 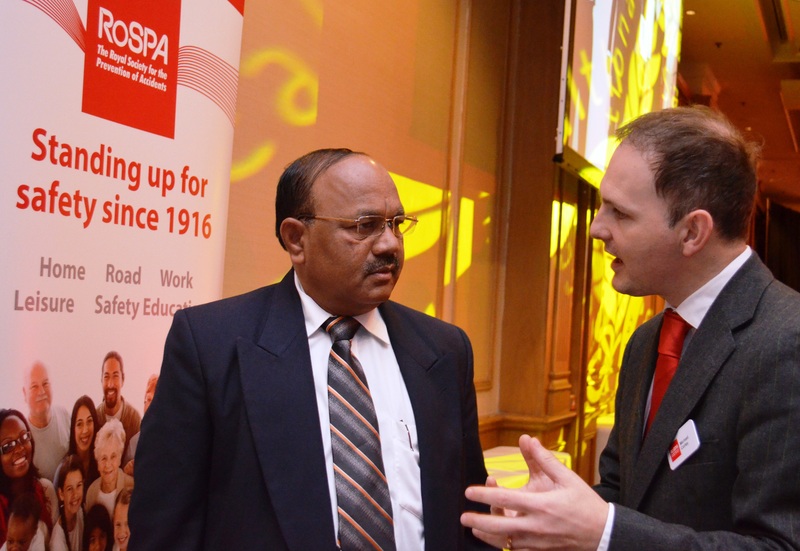 Michael talks to a 2013 Award winner all about the accident prevention work which RoSPA undertakes in order to fulfill its mission: to save lives and reduce injuries. The coming together of hundreds of the world’s best workplace safety practitioners at the city’s Hilton Hotel, yesterday (September 19), allowed RoSPA to reward much dedication and innovation – and to showcase some of the life-saving schemes that the UK’s best-known safety charity run on a regular basis. As is now customary, RoSPA uses such get-togethers to rally support from those who are most likely to give it. The same event last year raised enough money to help run two campaigns to stop more young children dying in window blind cord and driveway-related accidents. This year, guests very generously donated almost £4,400. This money will go some way to ensuring that every child starting primary school in Scotland next year will receive a free book. The publication, penned by popular children’s author Linda Strachan, will help to keep tens of thousands of young ones safe from the hazards that pose the most risk to them. But it’s a project that still needs the support of others to make it happen. With your help, we can (and we will) make it happen. Such is the power of prevention – through the coming together of all those who are on the same mission: to save lives and reduce injuries. Simply email FUNDRAISING@RoSPA.COM to find out more. 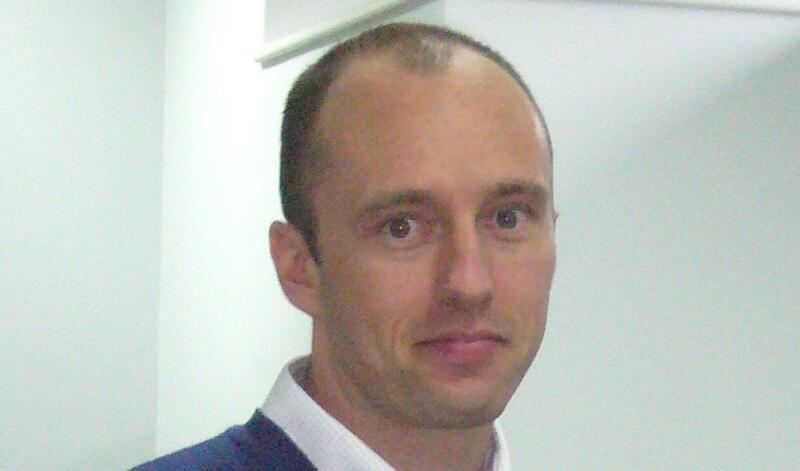 Michael Corley, RoSPA’s head of campaigns and fundraising, prepares for his marathon challenge! That was several months ago. Since then the tea and the biscuits have gone*, replaced by bottled water and fruit, the dreaming replaced with the waking realisation that 13 and a bit miles is a lot further than I’d thought**. American author Mark Twain said the secret of getting ahead is getting started. Mercifully, the organisers of the BUPA Great Birmingham Run had made that bit simple for a flaky first-timer like me by providing a training schedule. Printing it off and tacking it to the wall was the easy bit. Getting up at 7am on a Sunday and going out after a gruelling day at work is the not-so-easy bit. With the main event on October 20, several more weeks of this self-inflicted punishment await me. But then when I’m wheezing through bronchial tubes and feeling twinges in my gammy knee something suddenly occurs to me: I’m doing this for a damn good reason. If you haven’t already guessed (given the nature of this blog), the UK’s biggest killer of young children is…accidents. I’m running to raise money for RoSPA – the UK’s biggest and best-known accident prevention charity. We conduct campaigns to protect people at every stage of their life. Our work is proven to be low cost and high impact and is welcomed by all those who benefit from it. You can find out more about our life-saving work by visiting our website. To help, you can sponsor me – or join me. At the time of writing, places were still available for the Great Birmingham Run – and RoSPA would love to see other people pounding the streets on its behalf. To support our charitable mission in other ways, please visit our fundraising webpage or email FUNDRAISING@RoSPA.COM. We’d love to hear from you. Now, if you’ll forgive me, I have no time to lose – I must get back to my training *dips another biscuit into a big mug of coffee*. *This is not strictly true. NB Some dramatic licence has been used in the making of this blog. It’s been one of the hottest summers for many years and more scorching temperatures are on their way this week. But with the heat, we often see young people, particularly men, tempted to cool off or jump into open water. Supervised sites are the safest places to swim. During the July heatwave, which lasted for around three weeks, we are aware of at least 21 deaths for people who were swimming or playing around water – about the same number as we normally see for a complete summer month. Water can look incredibly tempting especially on a hot day and I understand fully why people want to get in and cool off. Although I don’t want to be the grumpy old man of summer, there are some things that need a bit of thought before you get into the water. 1. Go to swim at a lifeguarded beach, lido, swimming pool or bathing spot. This is the single most positive thing you can do for your safety. 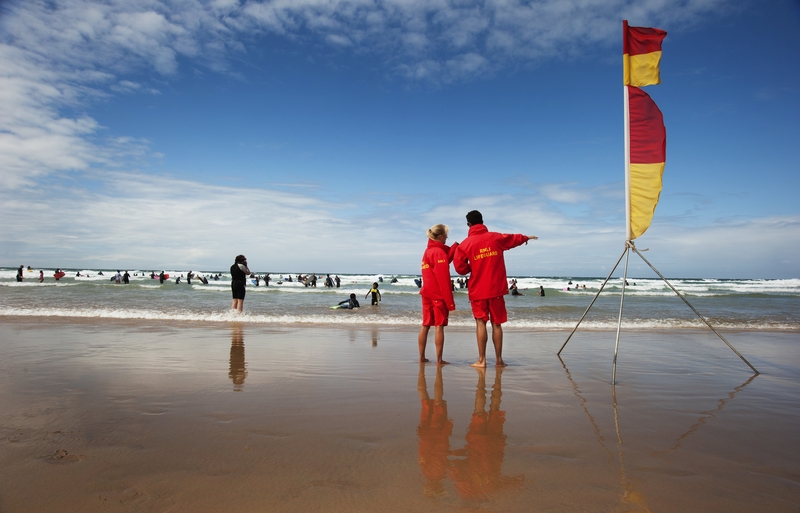 Last year, there were no deaths in lifeguarded swimming pools and, as far as I can tell, there were also no preventable deaths at lifeguarded spots such as beaches and lidos. In addition, you will be swimming in clean water and there will be an ice cream van too. 2. Take it slowly – think before you enter the water. A common scenario is when a young male, typically aged between 15 and 30, jumps or rushes into cooler water (15˚C or less). Remember there can be a big difference between surface water temperature, which can be in the 20˚Cs at this time of year, and the layers below, which can be much cooler at or below that critical 15˚C. The cooler temperatures can lead to a swimmer going into cold shock. Cold shock is the term we use for the impact of cold water on the body. In short, after a quick entry into water your heart rate jumps up, you start to hyperventilate and lose the ability to control your breathing, whilst at the same time your muscles cool down and you start to lose the ability to swim. 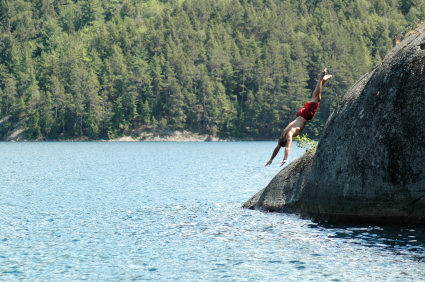 Jumping in into cooler water can lead to cold shock and swim failure. If this happens in a cold bath, you can jump out, but in open water, it’s not so easy, and ultimately – in the worst case – you inhale water and the drowning process begins. (iii) Swim outside all year round more or less, and become a habituated open water swimmer – training your body to get used to cold water temperatures. Realistically, if you are not going to wear a wetsuit or train to be an open water swimmer, the best thing you can do is get in slowly and get used to the conditions. 3. If you want to drink alcohol, have your beer after you swim, not before. It affects your judgement, can make you more susceptible to cold and in my opinion it tastes much better in that order! 4. When you’re not at a supervised site, be sociable and go with other people. If someone else is there, they can raise the alarm and help you out, or vice versa. It could be a lifesaver. Warning signs are there for a reason. 5. On a final note, if you see a site with signs that say “don’t swim/deep water/beware”, it’s your decision if you choose to ignore them, but be aware that this might be backed up by local laws. Ultimately, the reason for the sign is because the manager or someone who knows the area really well is of the opinion that they can’t make the place safe enough for you to use. 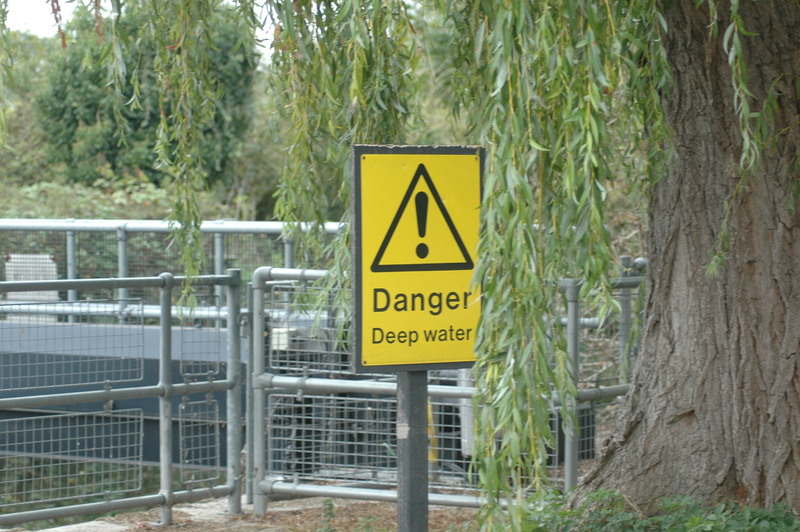 As a minimum, think really carefully before you go in, particularly if the signs point out hidden currents and structures, such as weirs, deep and cold water. 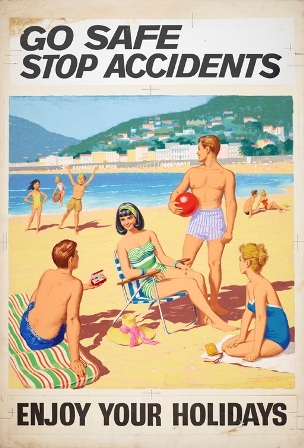 Hopefully, that is some help, so enjoy the hot weather while it lasts! 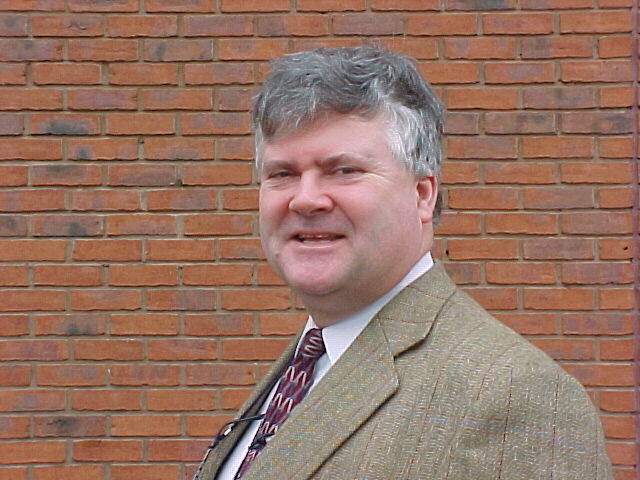 David Walker, leisure safety manager at The Royal Society for the Prevention of Accidents (RoSPA). Sensible safety is the order of the day – it’s not about wrapping everyone up in cotton wool, but about parents, carers, teachers, employers and others all having a role to play in empowering people to make their own decisions about safety, based on the facts. 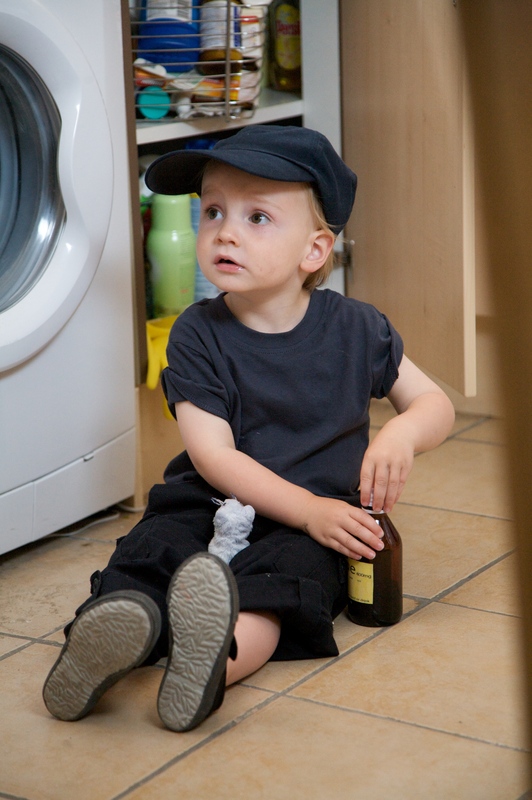 Children can easily get hold of toxic cleaning products if safety catches are not put on cupboards. Sometimes the facts have been difficult to find of late as the collection of useful data, or rather lack of it, is a frequently discussed matter. But obviously, the more we know about how an accident happened, the more we can do to ensure it doesn’t happen again. 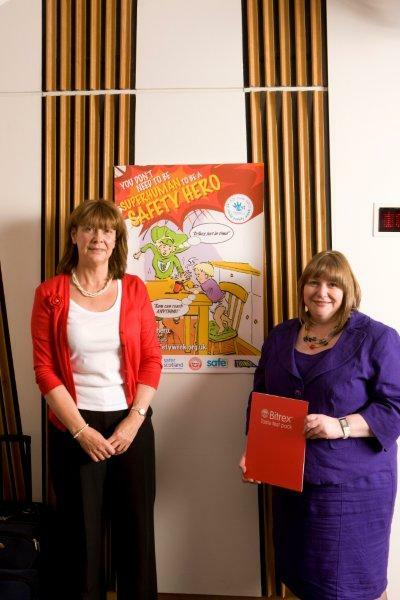 A new Cross Party Group on Accident Prevention and Safety Awareness has been set up in the Scottish Parliament which can delve more deeply into how and why accidents happen. This will be a fantastic opportunity to bring together politicians, practitioners and the public to discuss not only the everyday dangers we might face at home, on the roads, near water, in schools, or at work, but more importantly to offer practical solutions to avoid serious injuries that can usually be prevented. I’ve been with the Royal Society for the Prevention of Accidents (RoSPA) for 18 years and have worked in both the home and road safety sections. I also have my NEBOSH National Certificate in Occupational Safety as well as a Masters degree in Injury Prevention and Safety Promotion. All of the above has led me to look at safety from a holistic point of view and not as being compartmentalised into separate silos. If a child, for example, is injured in the home, then it is very likely that a parent will take time away from work to see to that child, take them to hospital or care for them if they need to be off school. Therefore, employers should be interested in safety in the home “off the job” as well as safety in the workplace. Small to medium enterprises in particular will depend more on their few key members of staff and should think about helping employees to prevent accidents happening to themselves or their families at home or on the road. Importantly, everyone has a role to play in ensuring places are as safe as they need to be, while also recognising that we still need the freedom to do those exciting (and healthy) activities we relish in our leisure time. Politicians and government officials have an array of policies within the respective administrations of the countries of the UK to help them make big decisions. But dare I say that, perhaps, when policy decisions are made at these senior positions, it can be difficult to track whether they have been converted into practice at a grassroots level? Unfortunately, well meaning, well researched guidance intended to be used at a local level might not always be translated into a practical solution suitable for the communities they were intended for. I am, however, delighted that this new Cross Party Group has emerged and that RoSPA Scotland is providing the secretariat for it. Convened by MSP Clare Adamson, the group also includes committee members: James Dornan MSP (SNP) as vice-convener; Alison Johnstone (Green Party); Jim Hume MSP (Liberal Democrats); David Stewart MSP (Labour Party); and Liz Smith MSP (Scottish Conservative and Unionist Party). 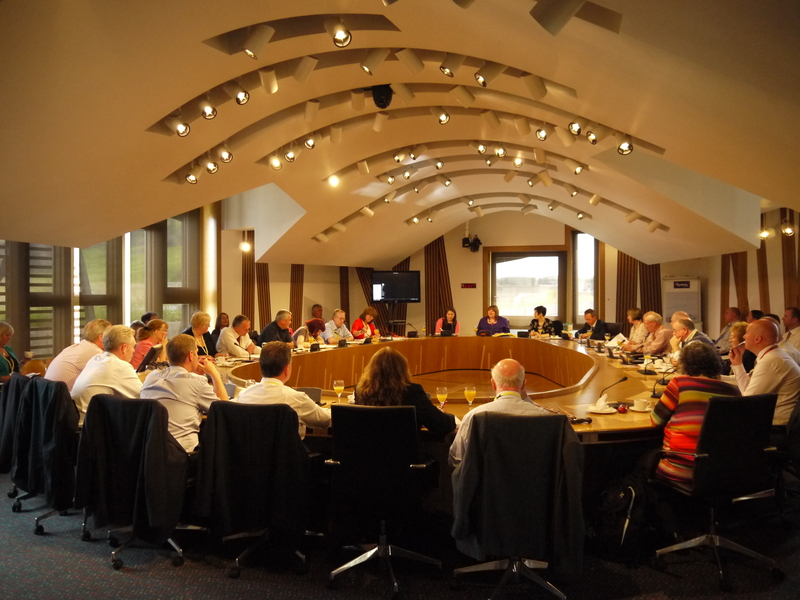 Child safety was the key topic at the group’s first meeting at the Scottish Parliament in June when the potential poisoning dangers of children getting their hands on toxic cleaning products, like liquitabs, were highlighted. Discussions also focussed on a new partnership between RoSPA and NHS Greater Glasgow and Clyde to provide education and practical solutions to families across the city on this issue, like keeping cupboard doors fitted with a catch. Discussions also looked at the wider issue of how families can prevent accidents from happening in their homes. Minister for Children and Young People, Aileen Campbell, even joined in with this inaugural session and noted RoSPA’s recent work with the Early Years Collaborative to provide home safety education to 800 families across Scotland, along with providing, and most importantly, fitting the safety equipment they require. The meeting room in the Scottish Parliament was full to capacity with people who had travelled the length and breadth of Scotland (and beyond) to attend this first meeting. It was overwhelming to see so many senior people from a wide variety of disciplines – trading standards, environmental health, motoring organisations, community safety, education for example. The lack of meaningful data came up time and time again in discussions, and particularly “why are we still not getting this right?” I have a suspicion this topic will be back on the agenda at future meetings. Watch this space! Further meetings will take place on October 2, November 27 and January 29 next year, and members are keen to hear from the public about topics they feel need to be raised. Anyone with suggestions, no matter how big or small, should email me at: elumsden@rospa.com. As I said, it’s an exciting time and we want to bring everyone along with us. Elizabeth Lumsden, community safety manager at RoSPA Scotland and secretary of the Cross Party Group on Accident Prevention and Safety Awareness. 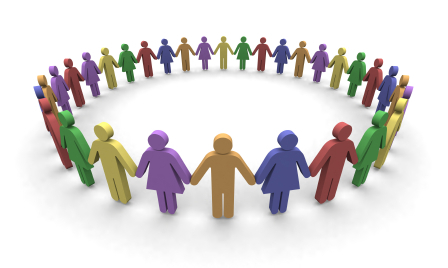 Building safer communities: your views needed! Safety knowledge is the power to survive, and it doesn’t just start and end at work. The safety knowledge, values and behaviours that people acquire in the workplace are invaluable in all areas of their life, not just for themselves, but for their families too. Many leading organisations use the workplace to help staff to stay safe, for example, by bringing in outside experts to talk about home safety, fire safety, first aid, safer motorcycling and so on. As a safety charity that has been at the heart of accident prevention in the UK and around the world for almost 100 years, RoSPA is keen to help organisations to expand their safety efforts to protect not just their employees, but others in the community with whom they interact. This got me thinking about how we can get health and safety professionals and organisations to work together more closely to share some of their approaches to spreading the safety message to wider audiences; in particular on their approaches to schools and community safety outreach. It is clear that there is currently a large amount of activity on these lines going on across many different sectors (construction, water, gas, electricity, rail, nuclear, chemicals, to name a few), but much of it is happening largely in isolation. This is why here at RoSPA we would like to create an open forum where companies can showcase their latest community safety work and share ideas. For example, this year’s winner of the Sir George Earle Trophy Morrison Utilities, which won the highest competitive accolade at the RoSPA Occupational Health and Safety Awards, has also received praise for its innovative community safety initiative aimed at primary school children. 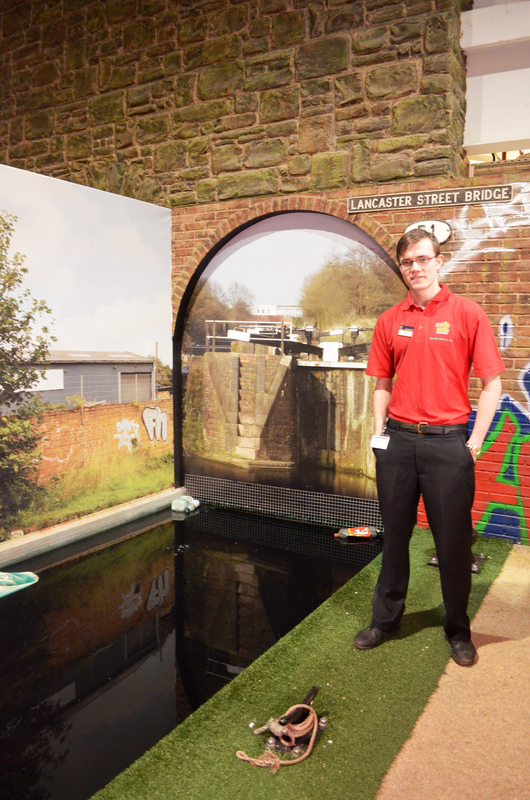 Jack’s Lucky Escape is a four-minute long DVD animation designed to highlight the dangers of street works’ sites. Teachers were provided with additional learning packs, such as “Spot the Hazard” worksheets to help support ongoing classroom discussion. Not only is this a wonderful example of how the utility sector can work in partnership with its stakeholders to raise awareness of safety among the public, but it also won the company a National Joint Utilities Group (NJUG) Award for Communications. “…safety is a 24/7 challenge and there are major benefits to business and wider society from sharing safety expertise and knowledge with others,” – Roger Bibbings, RoSPA’s occupational safety adviser. As a safety charity that has been at the heart of accident prevention in the UK and around the world for almost 100 years, RoSPA is keen to help organisations to expand their safety efforts to protect not just their employees, but others in the community with whom they interact. 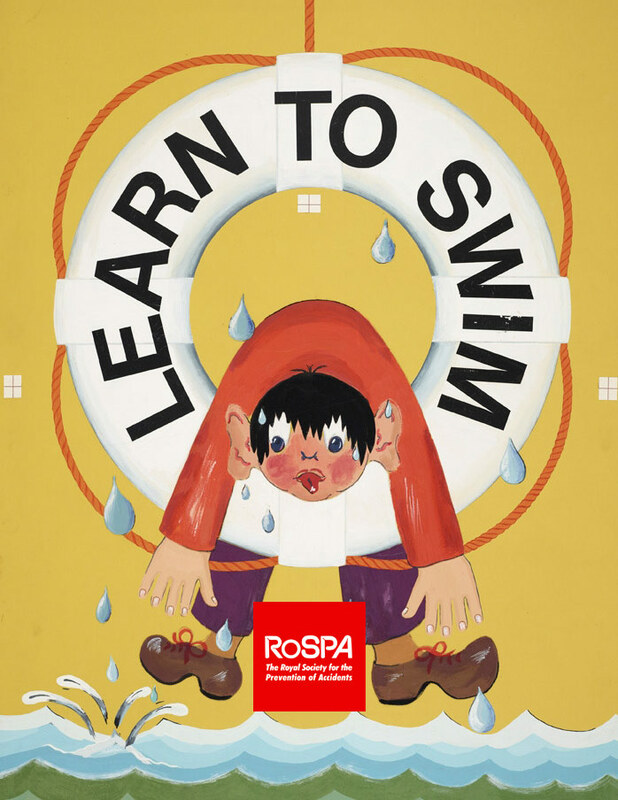 At RoSPA, we promote safety and the prevention of accidents at work, at leisure, on the road, in the home and in schools and colleges. We also play a central role in promoting the work of the LASER Alliance which brings together a range of UK-based organisations and individuals that believe in children and young people “learning about safety by experiencing risk” (from where the acronym “LASER” is drawn). So how do you feel about encouraging higher performers in health and safety to help us in our bid to build “safer communities”, by sharing safety messages far beyond the workplace? There are many companies out there who are engaging with the public both directly and indirectly, for example, not just via schools and LASER activities, but through a whole range of means including: family safety days, community liaison committees, even road safety messages on the backs of large goods vehicles etc, all based on the premise that safety is a 24/7 challenge and that there are major benefits to business and wider society from sharing safety expertise and knowledge with others. Let us know what you think and please do leave your comments below, or if you would like further background information or have any other questions, email me at rbibbings@rospa.com.